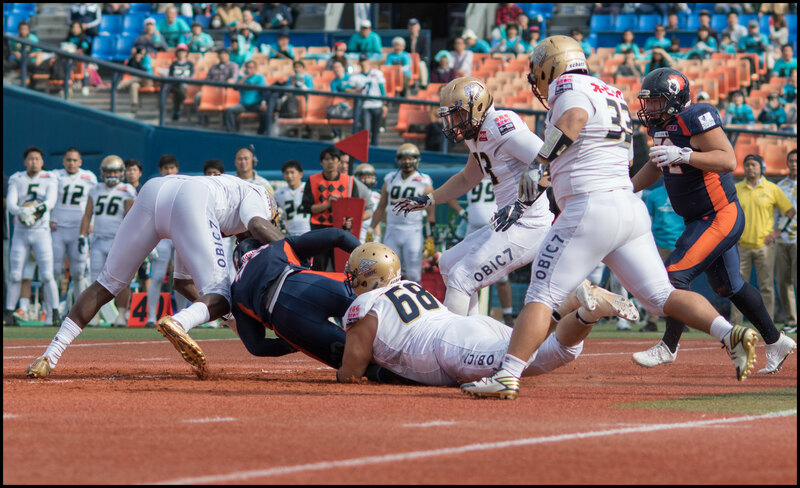 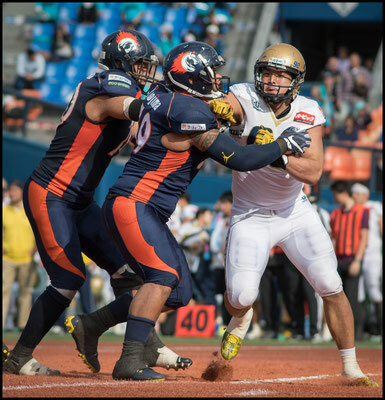 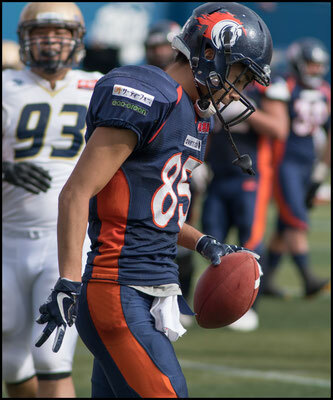 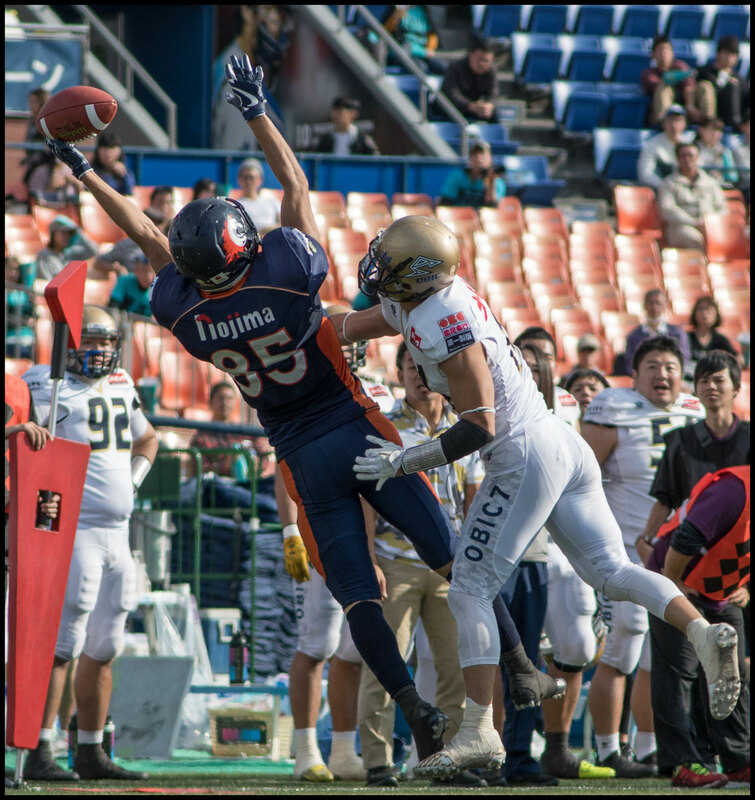 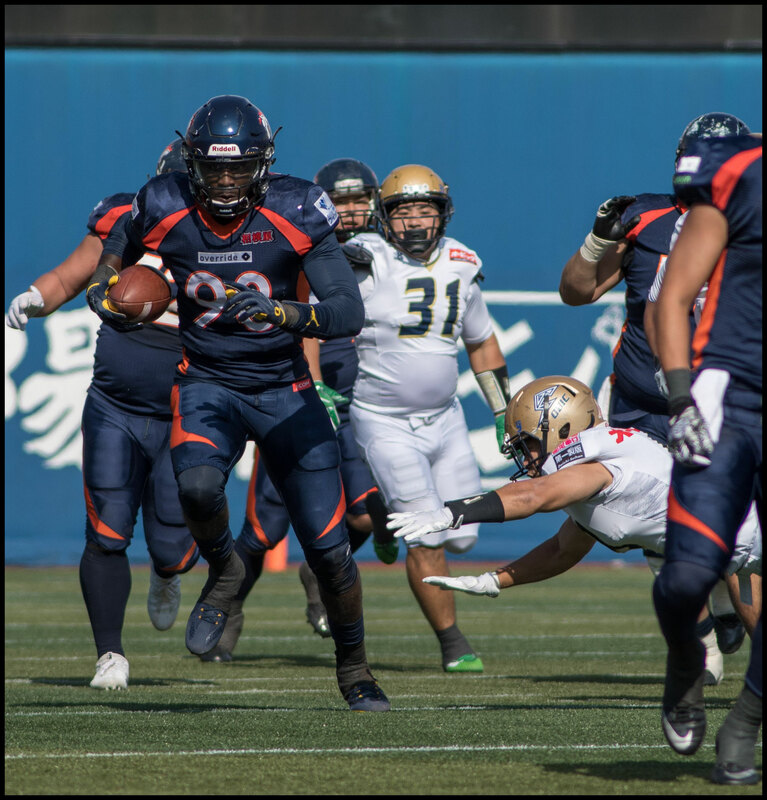 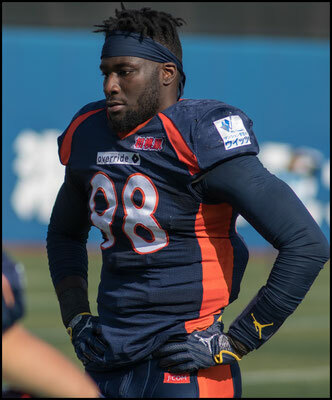 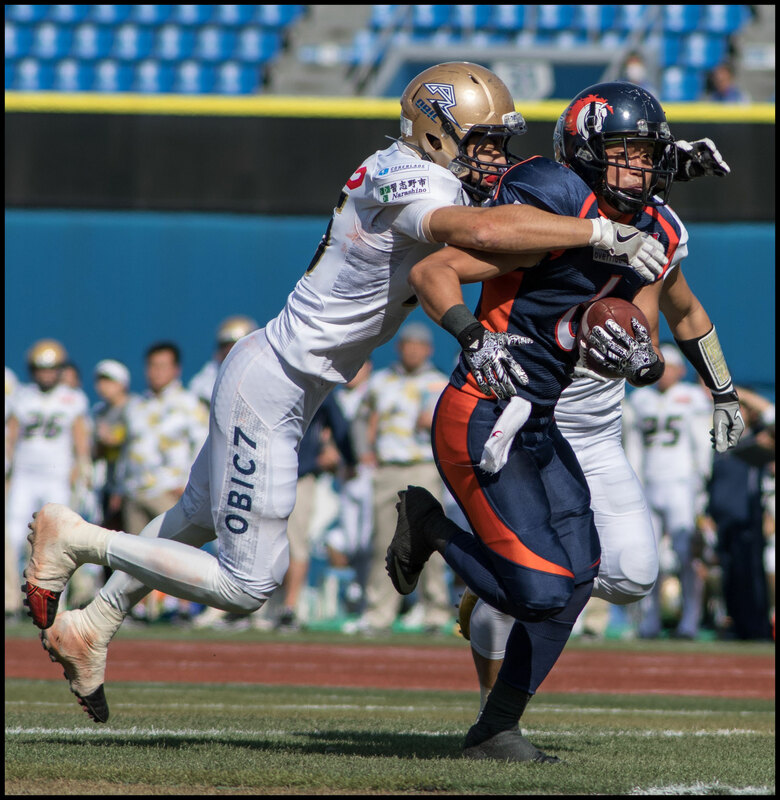 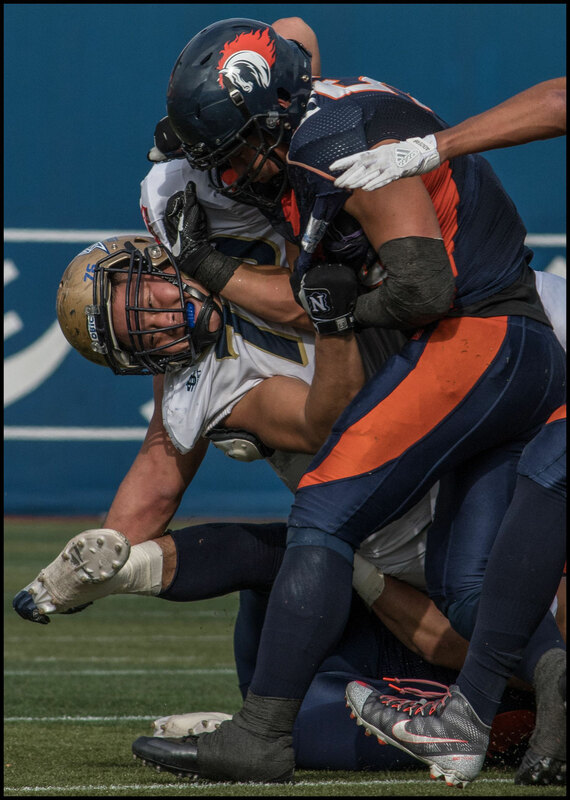 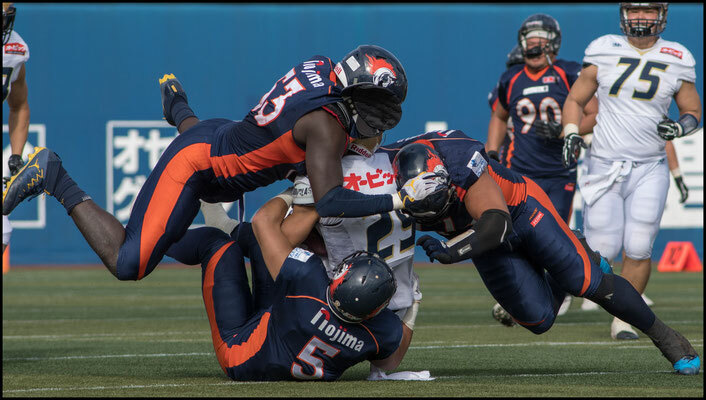 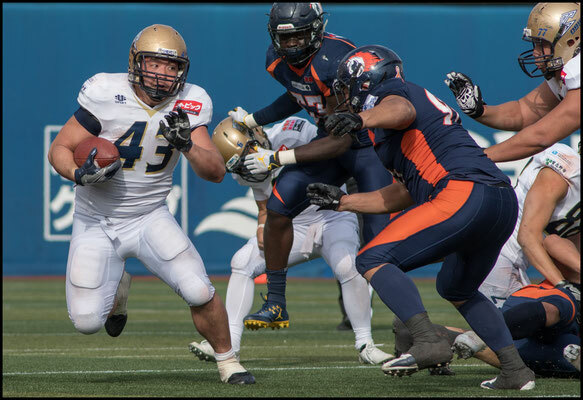 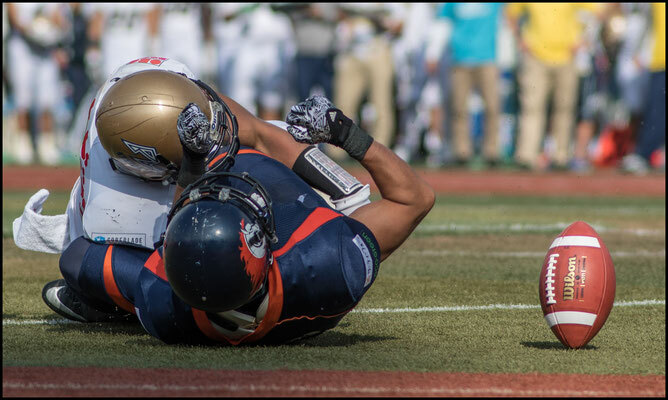 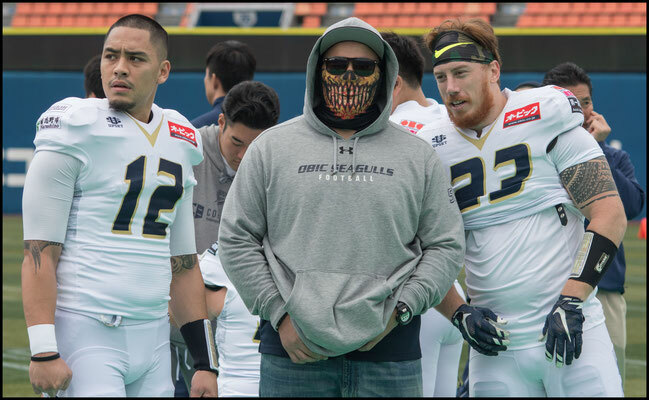 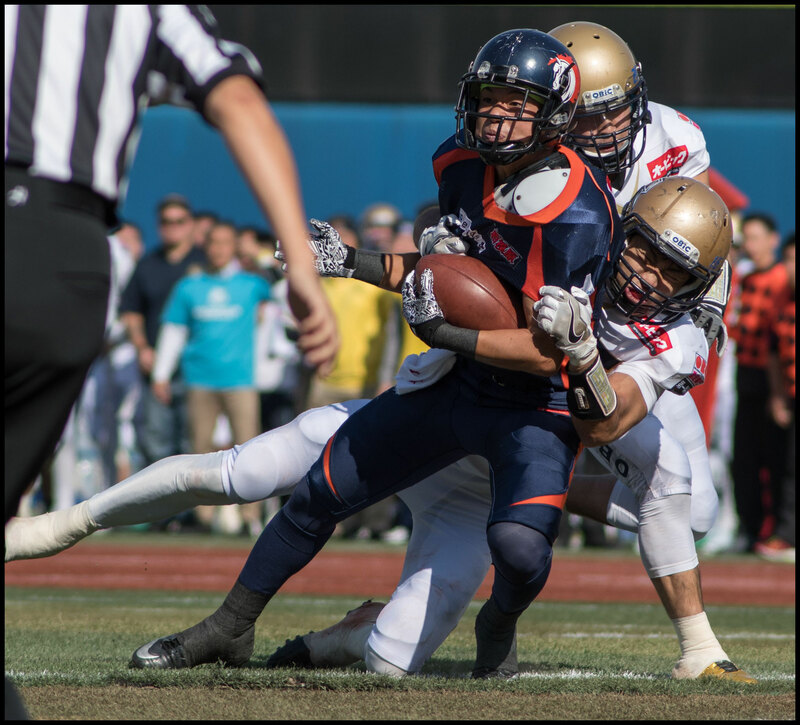 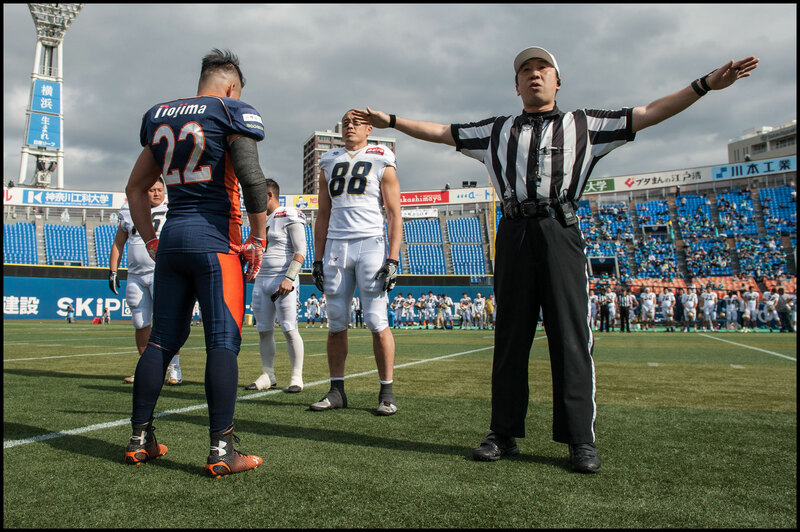 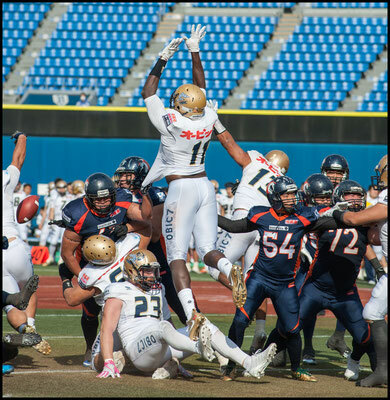 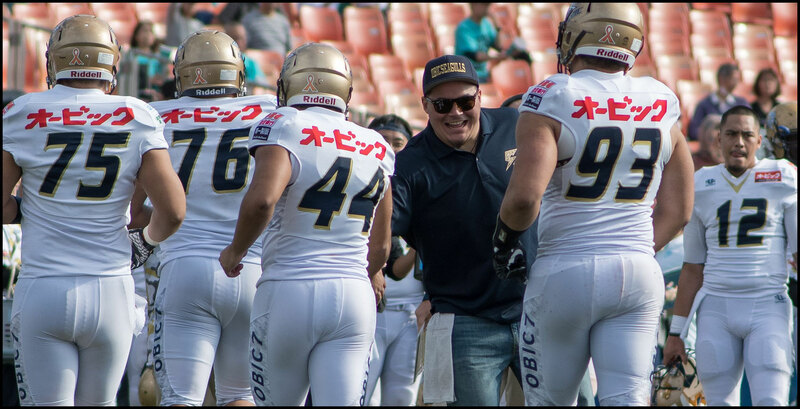 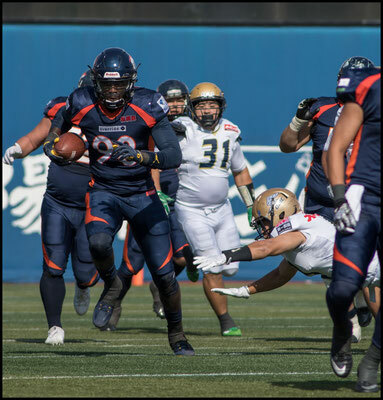 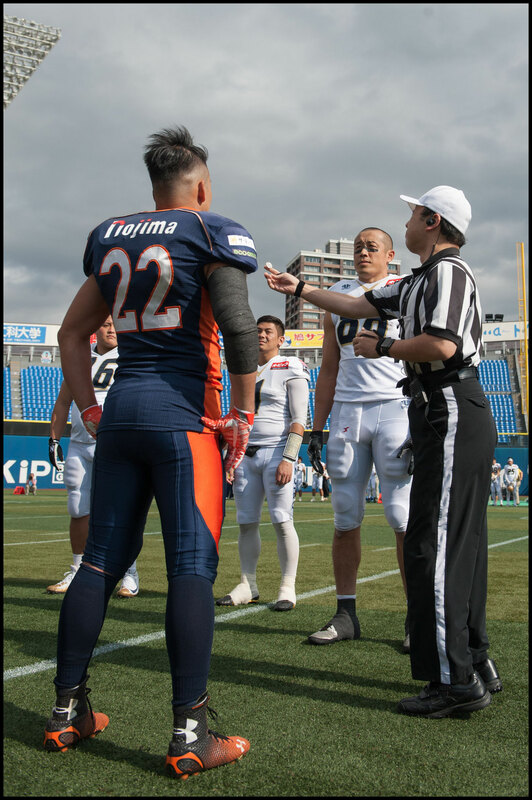 Obic Seagulls came storming out of the gates and blew Nojima Sagamihara Rise away in a whirlwind opening period at Yokohama Stadium on Saturday. 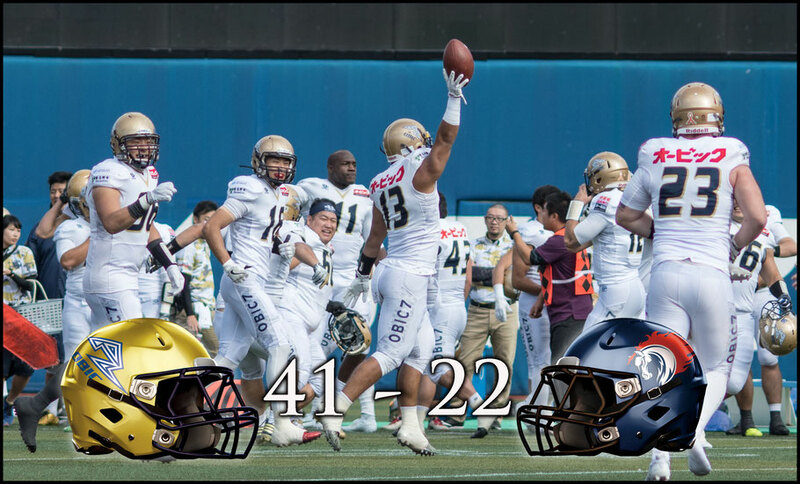 27-7 up at halftime, in a game many had predicted would be a close affair, Obic ended up running out 41-22 winners. 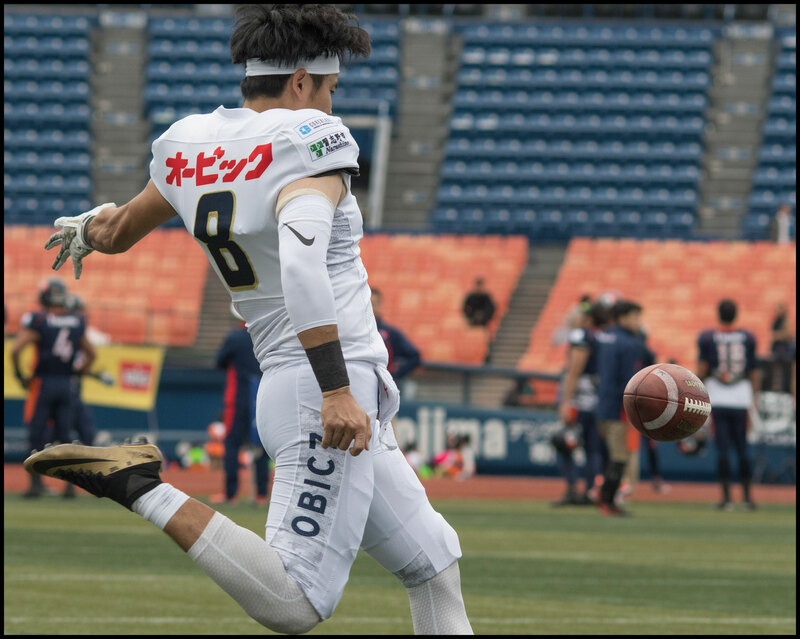 That 19-point gap hardly does credit to the dominance Seagulls exhibited throughout, with the Chiba based side being far superior on both sides of the ball. 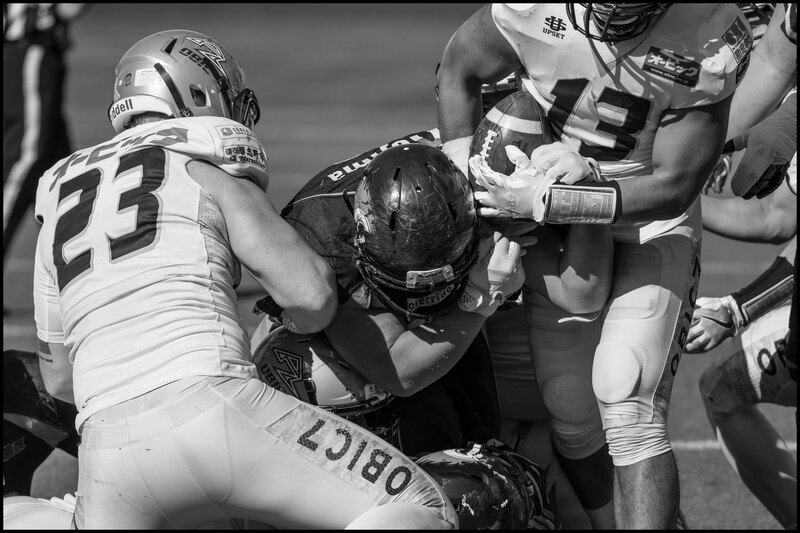 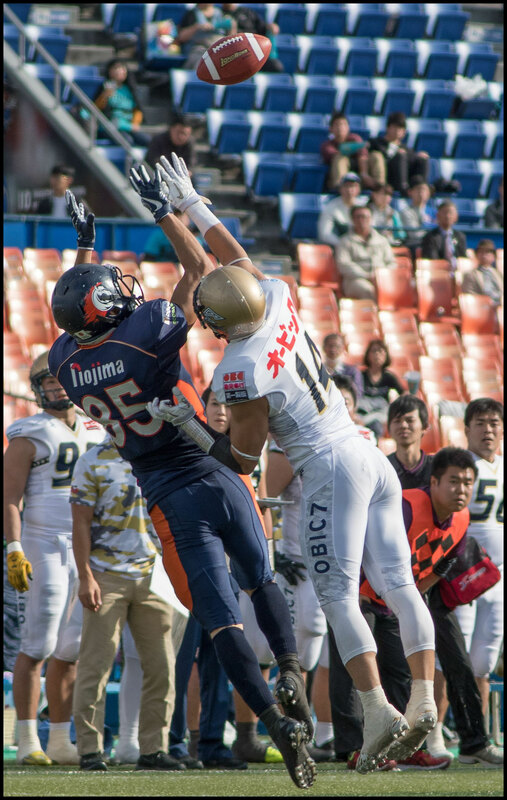 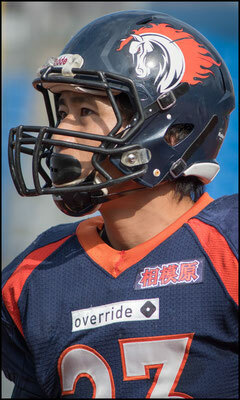 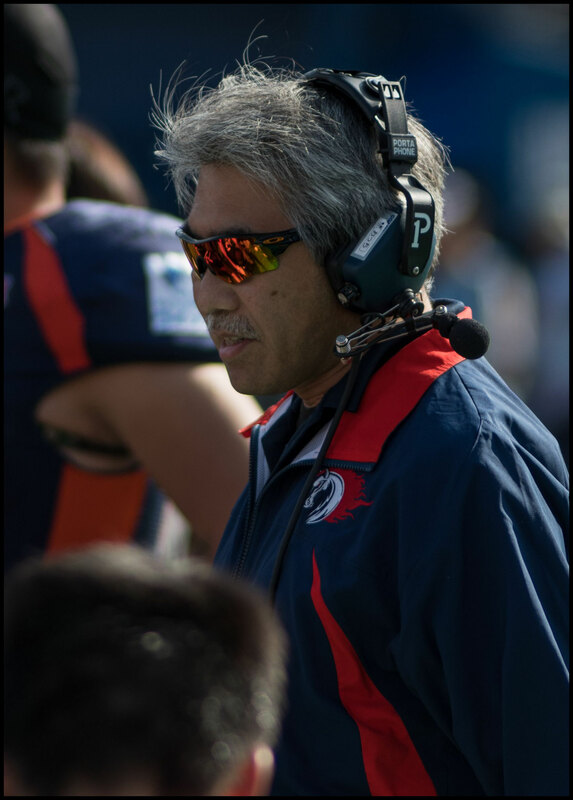 As was the case in the week two game between the teams, turnovers proved to be Nojima’s undoing. Devin Gardner was intercepted 6 times and 3 additional fumbles by the Rise completely negated the team's 441 yards of total offense. 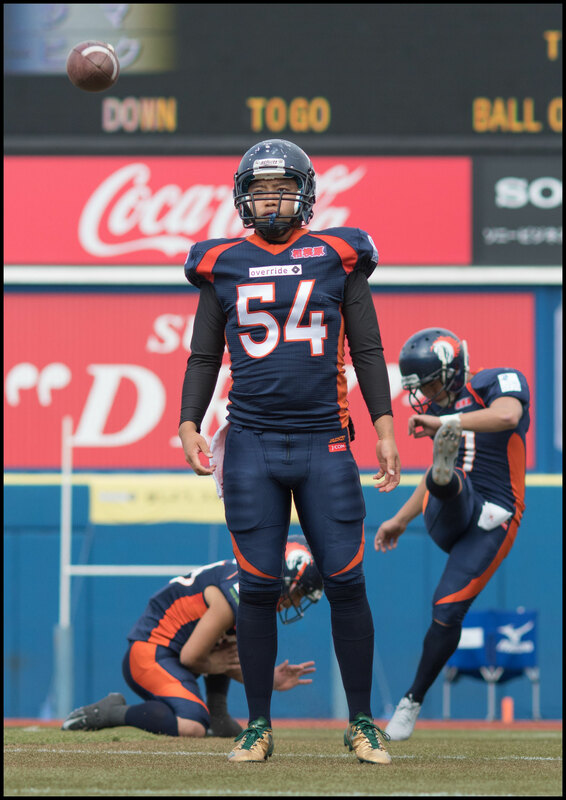 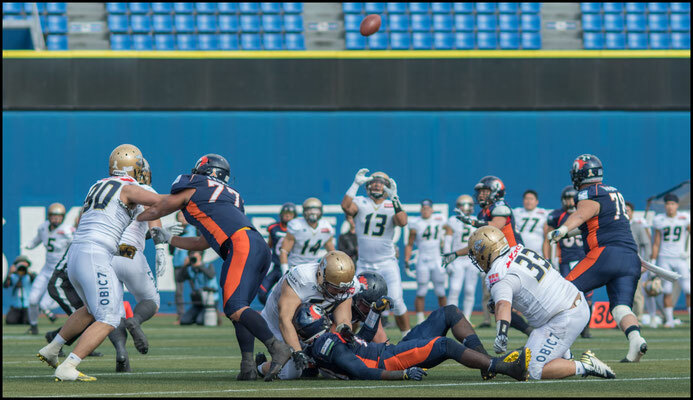 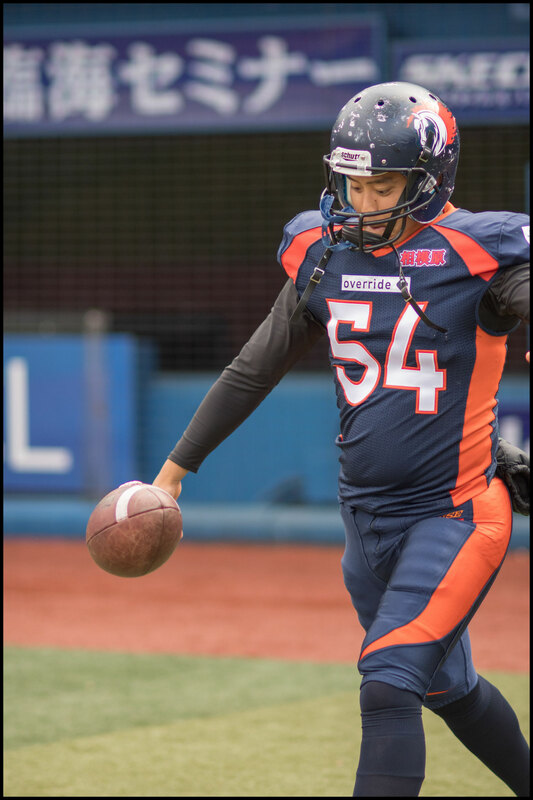 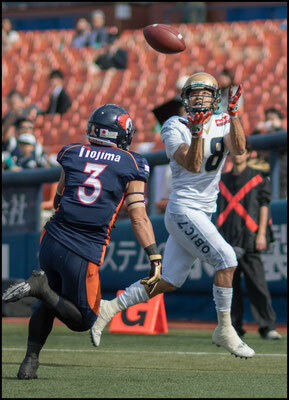 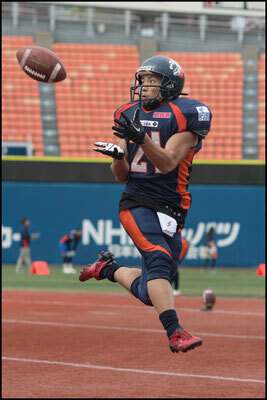 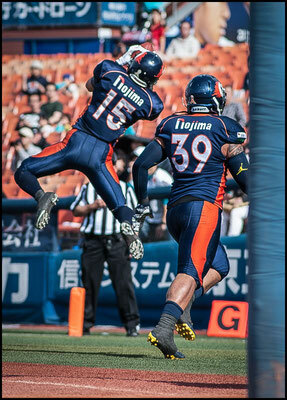 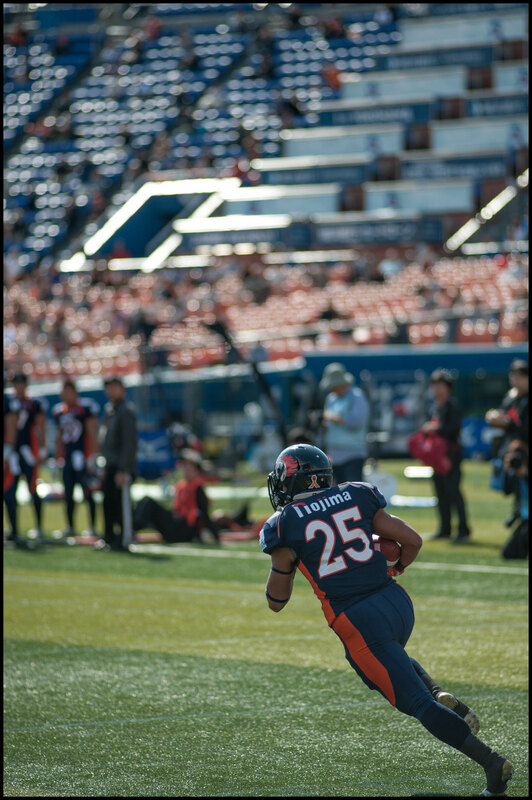 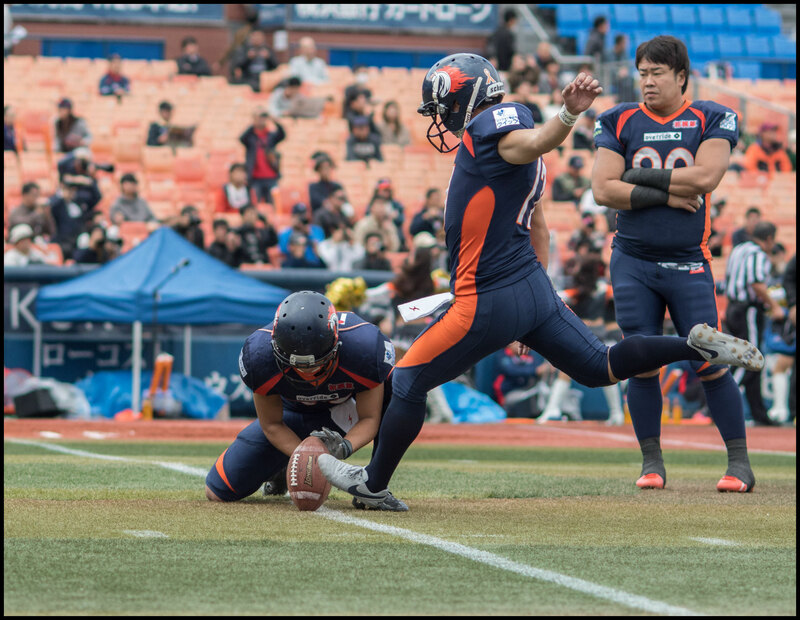 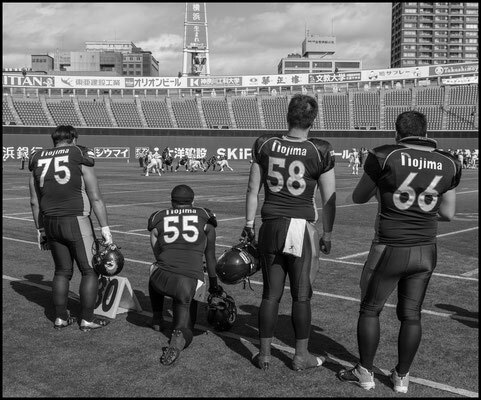 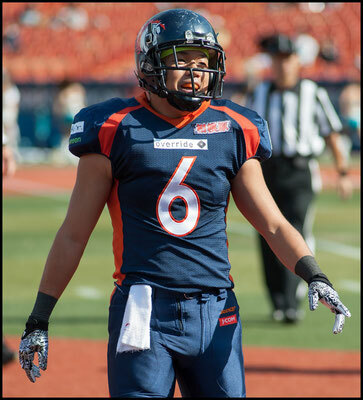 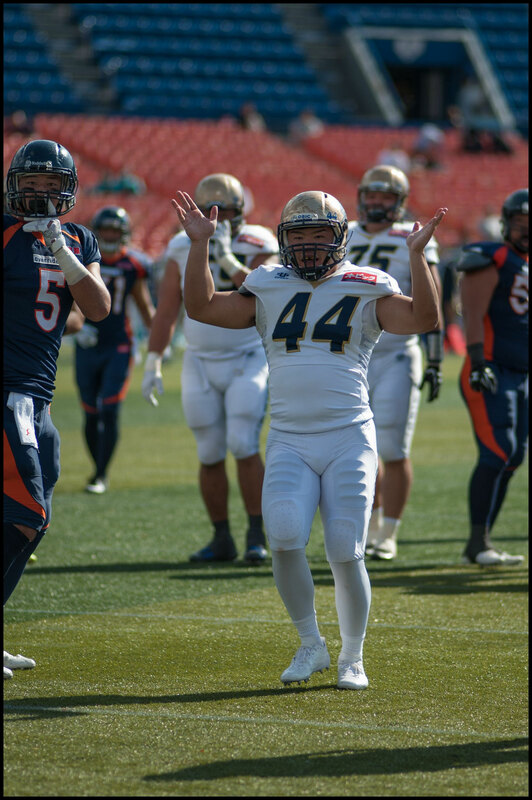 After punting on their initial possession Nojima proceeded to turn the ball over on five straight series. 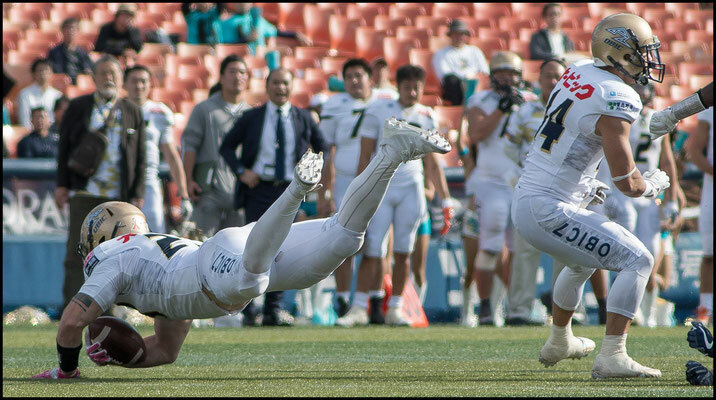 The scoring started early. 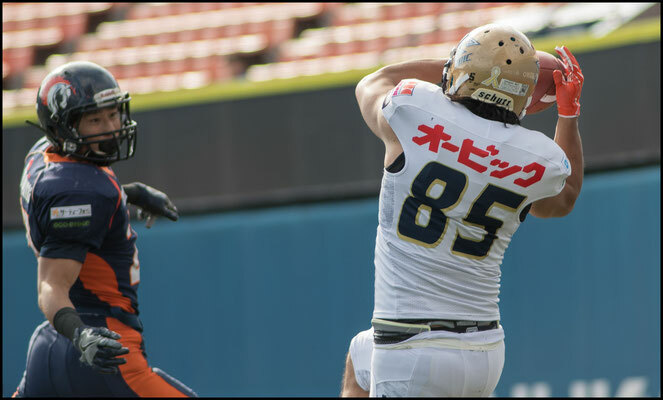 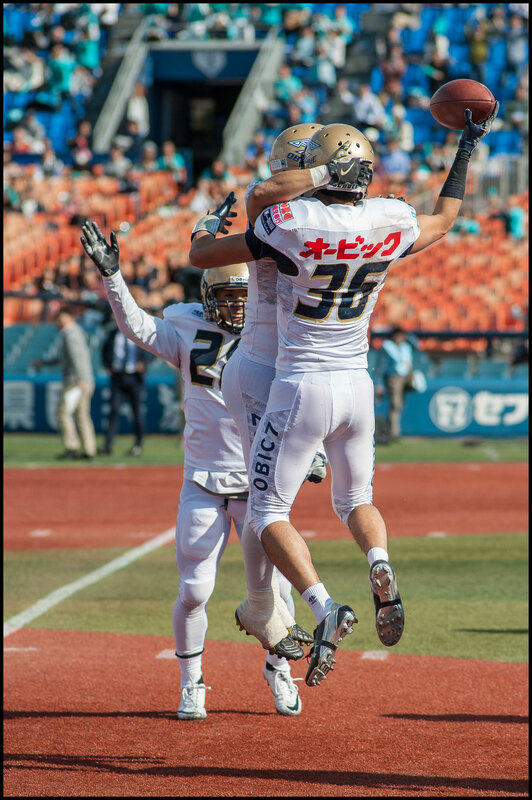 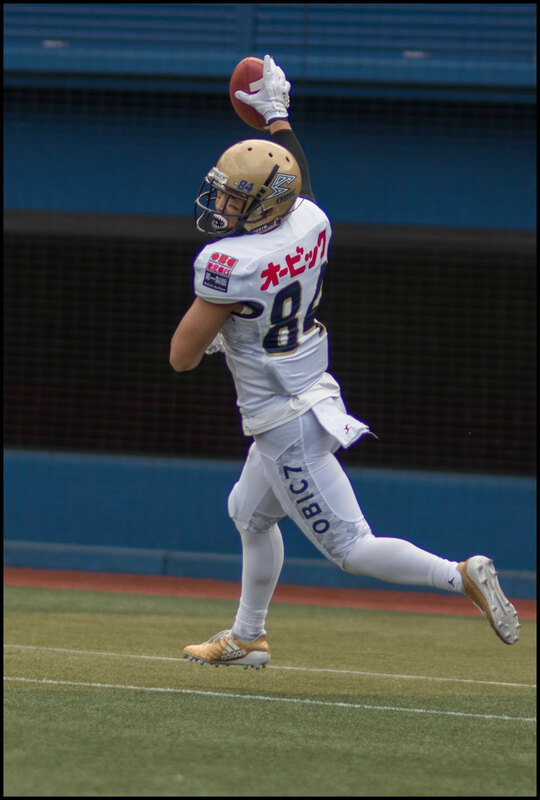 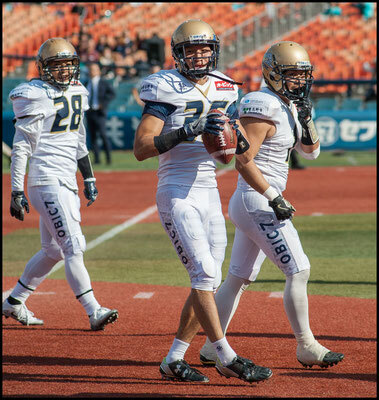 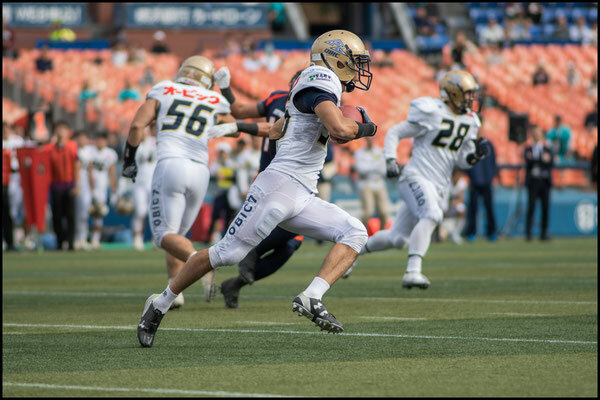 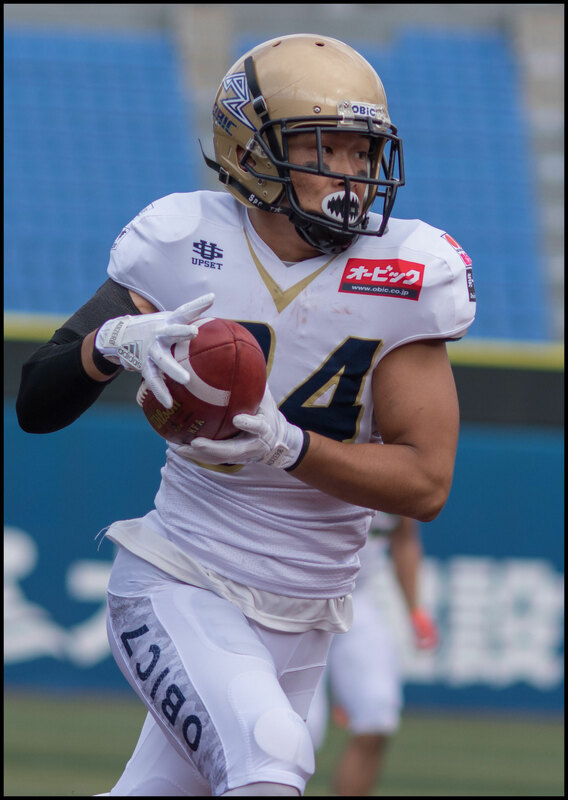 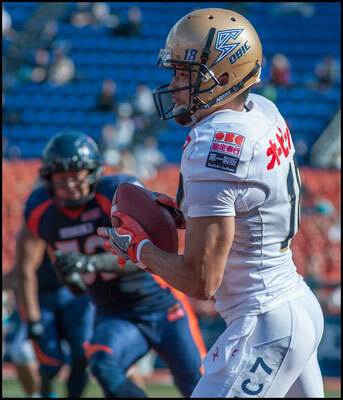 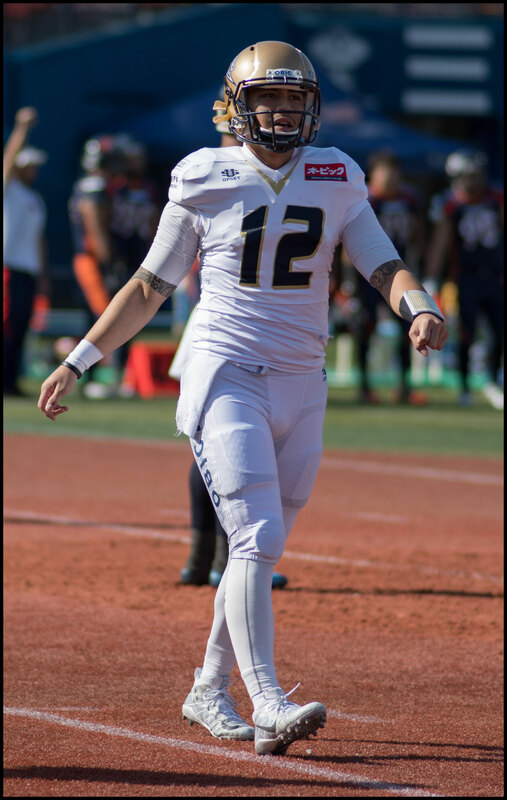 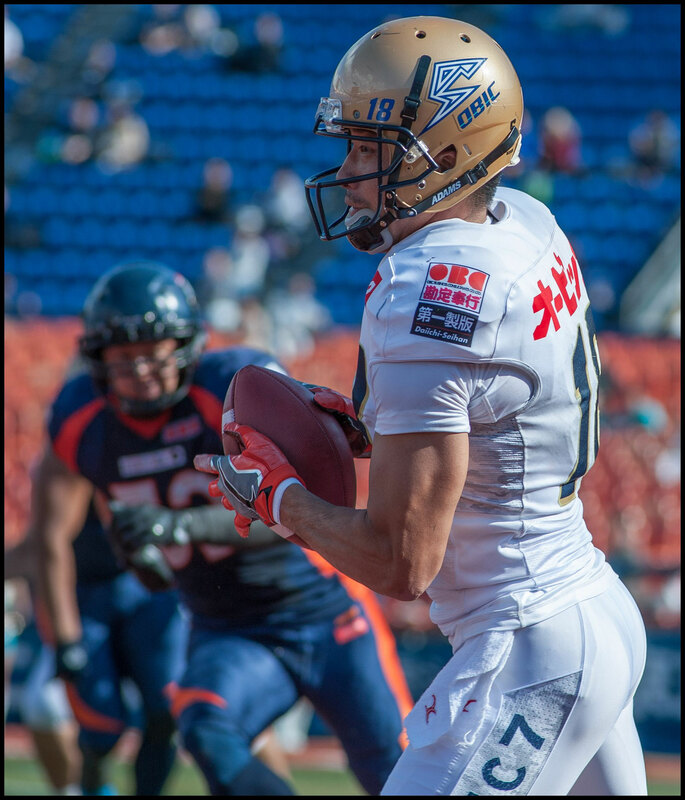 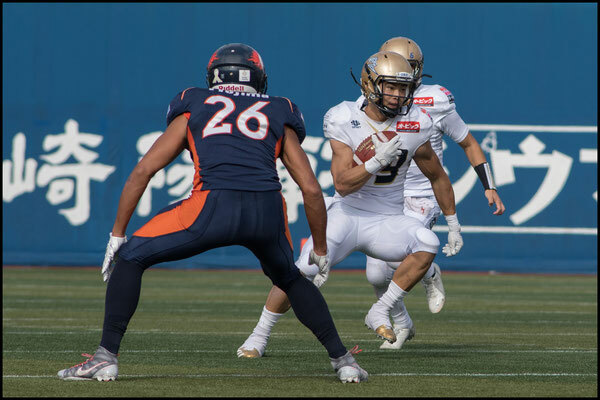 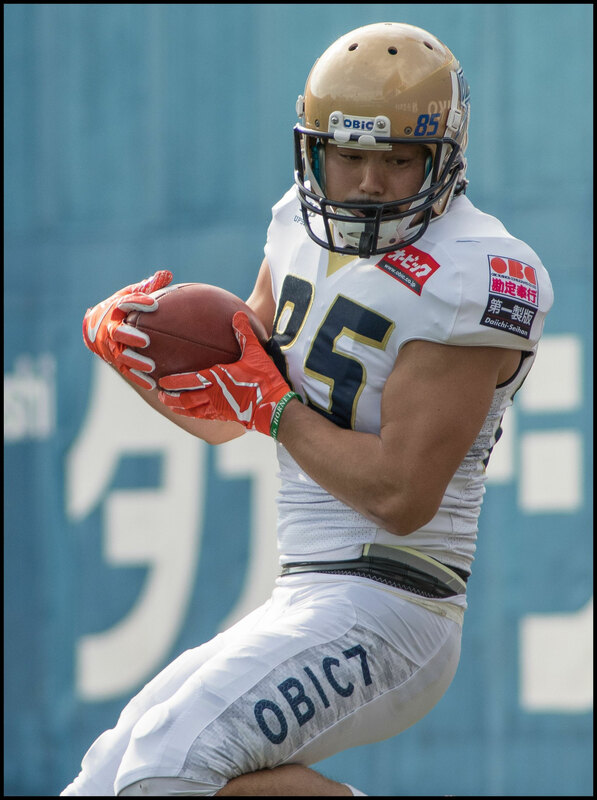 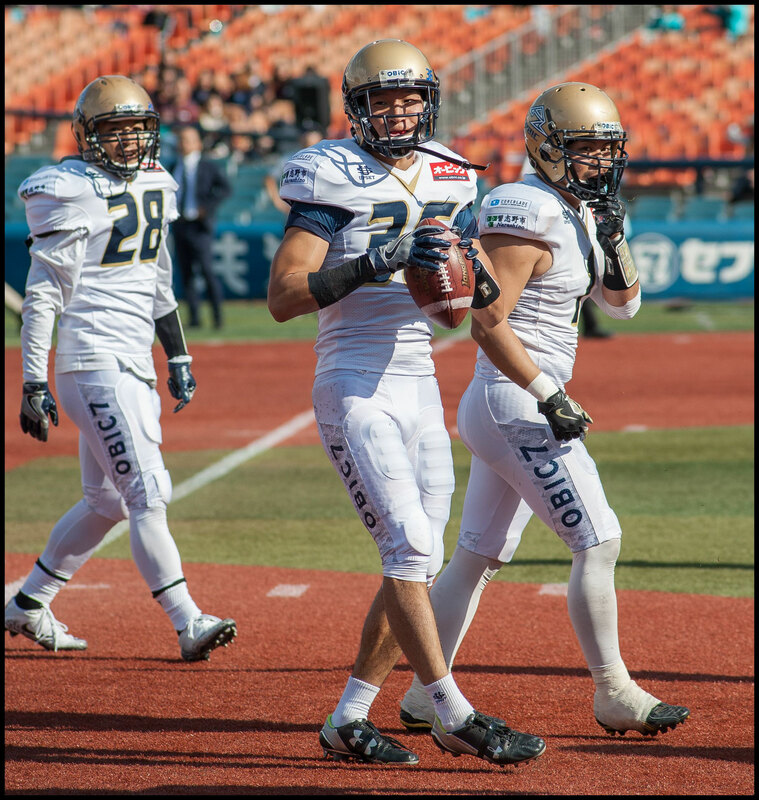 On just the third play from scrimmage RB Tomoki Chimura hit wideout Aruto Nishimura deep down the right sideline and the former Nichidai man took it the rest of the way for a 70 TD. 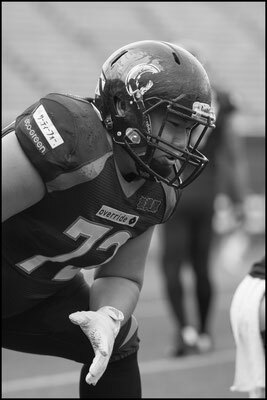 Shun Sugawara, taking the bulk of the snaps under center, found fellow veteran Noriaki Kinoshita for a another score five minutes later . 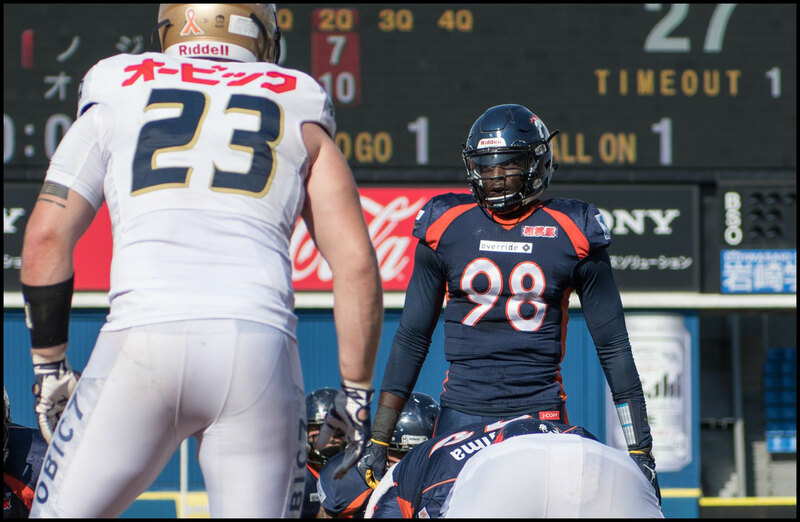 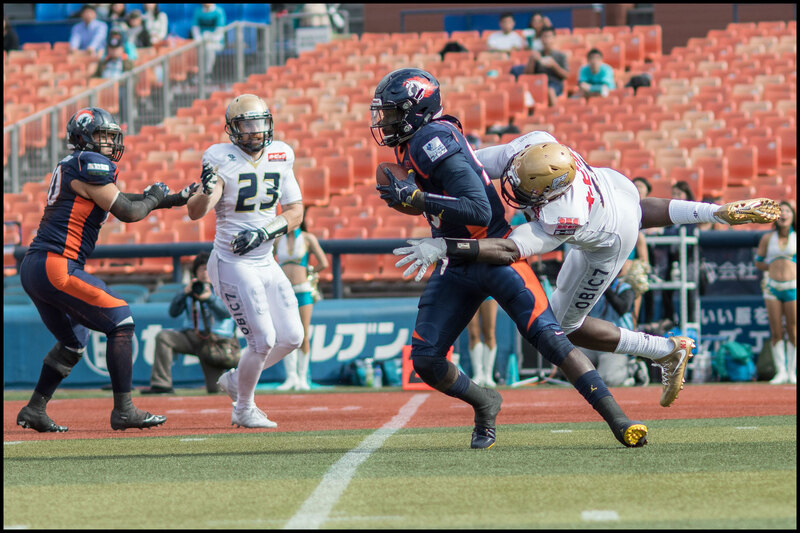 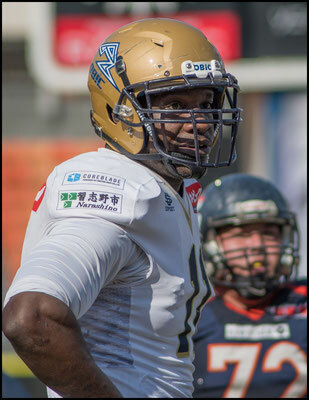 That was followed by a Taku Lee TD sandwiched between two FGs that left Nojima reeling. 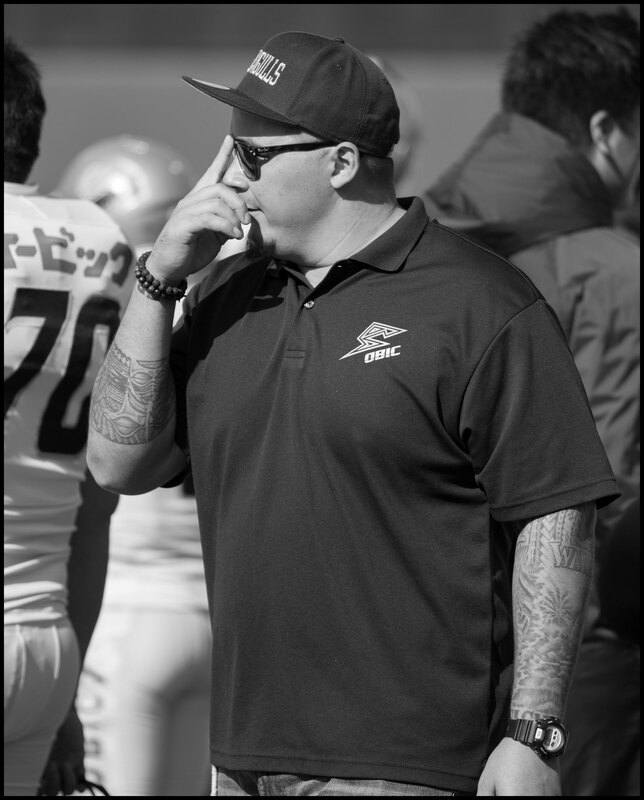 Sagamihara found some hope at the end of the second quarter when Gardner started to consistently hit players 10-15 yards down the right hash. 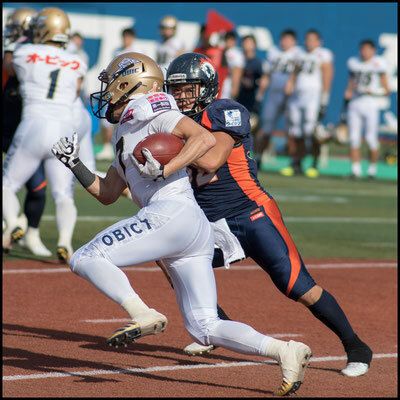 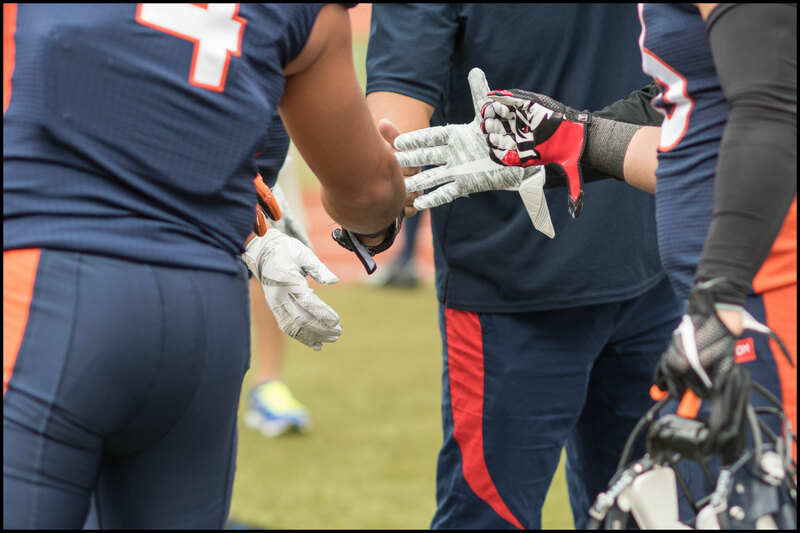 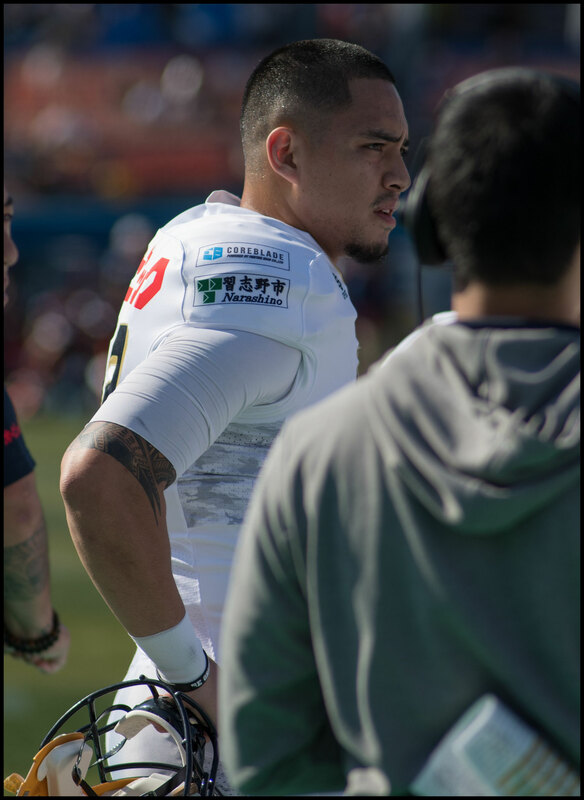 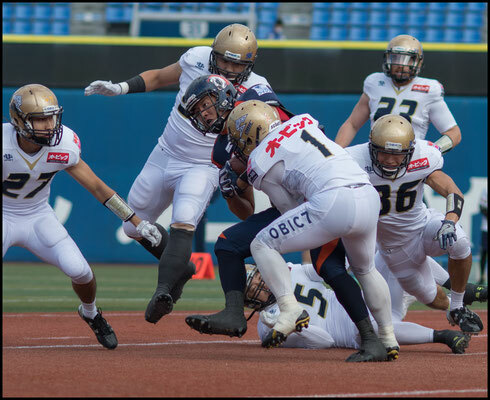 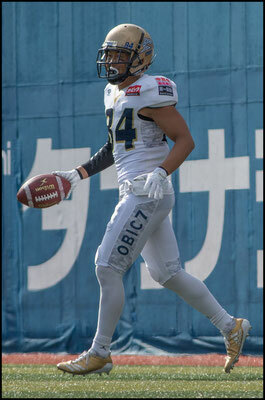 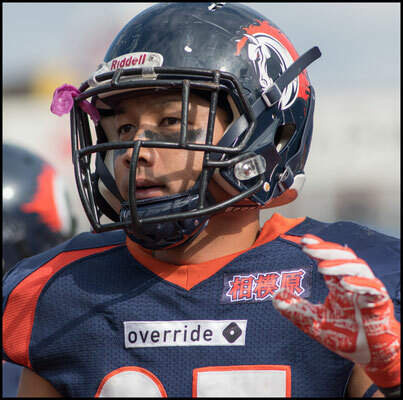 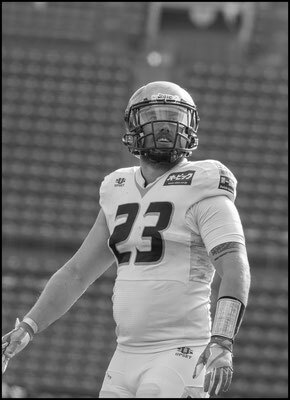 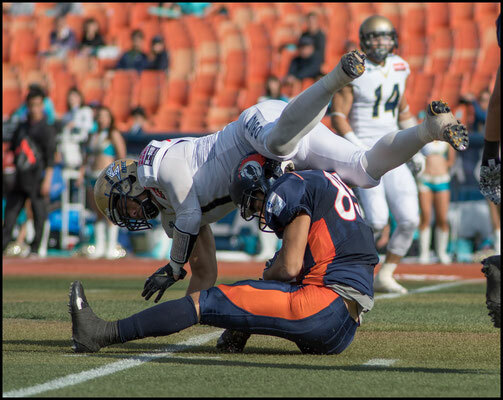 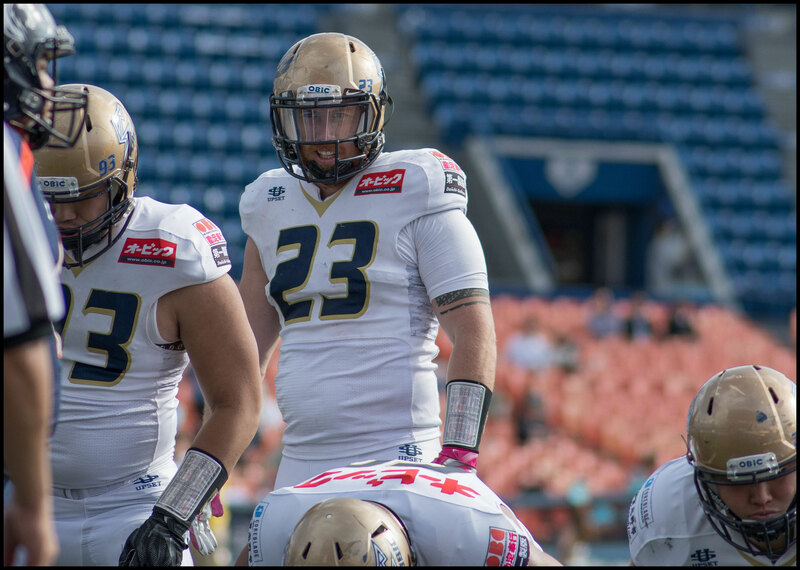 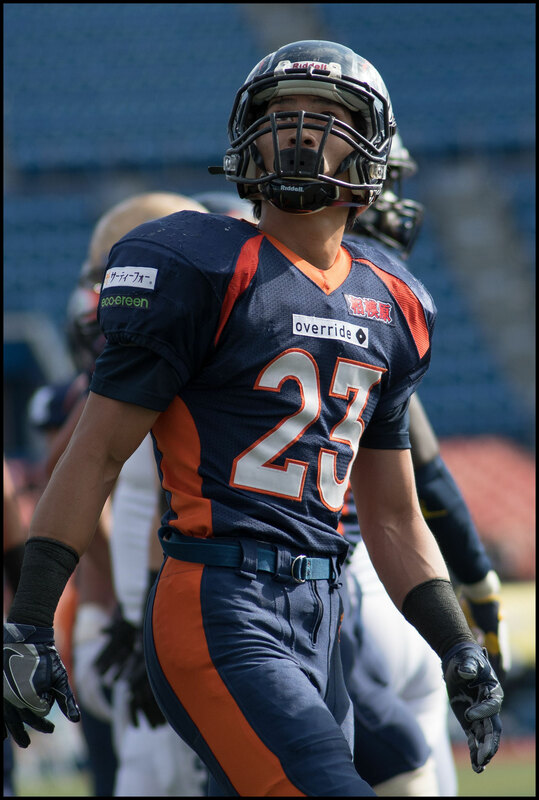 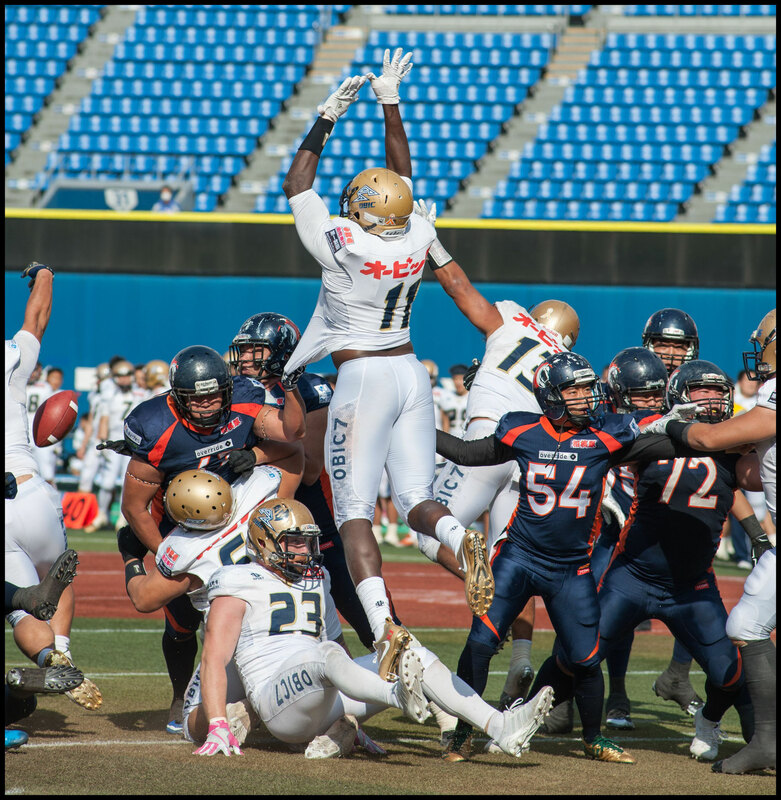 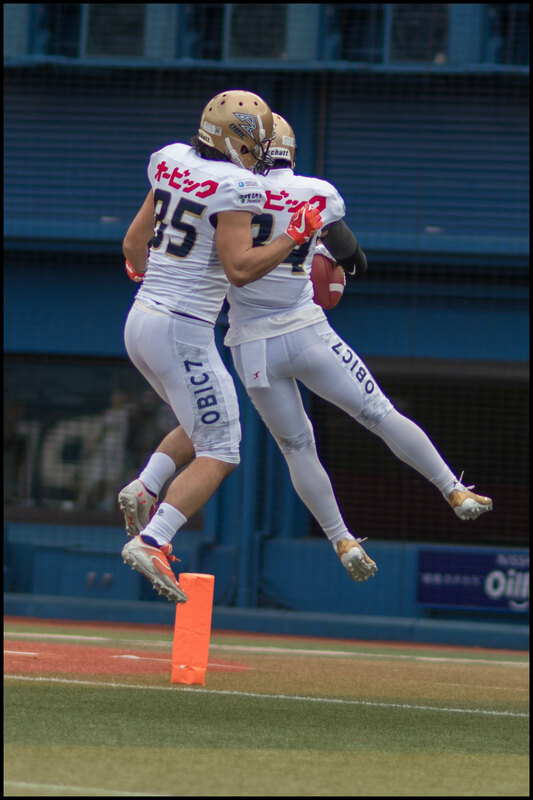 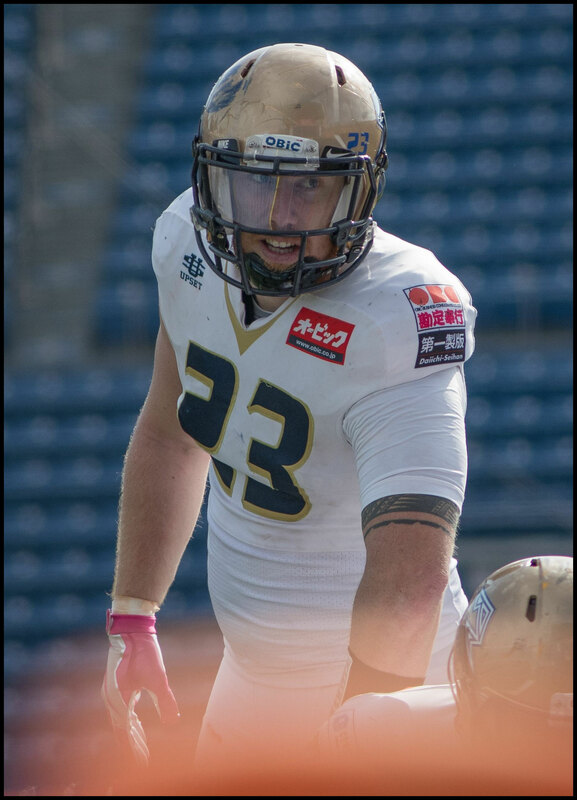 Rise scored one touchdown and were driving for another but with just two seconds left in the half and the ball right on the goal line, Obic's Kenji Miyake came up with a big stop, making a great open field tackle to end the period. 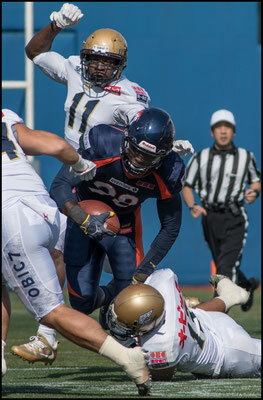 Despite the big score, defense was the star of the day for Obic. Gardner was under pressure constantly, with the pocket collapsing on what seemed like almost every play. 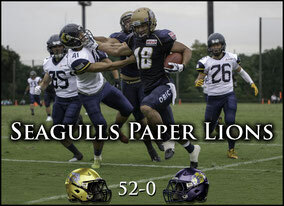 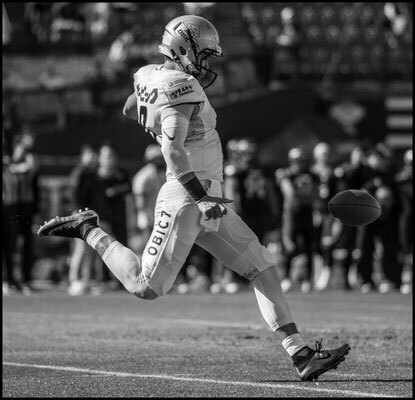 Seagulls had five sacks to go along with their nine turnovers. 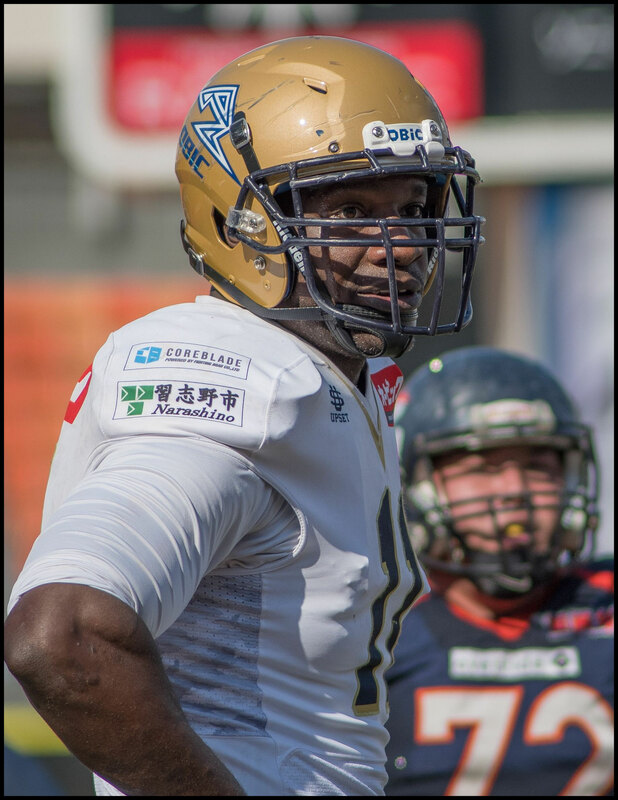 Veteran Kevin Jackson has two sacks and an interception but it was a dominant team effort with standout performances coming on all three levels. 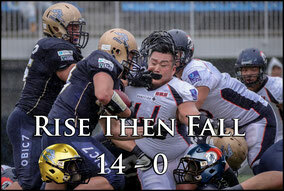 That was as close as Rise would come, as first Sugawara and then Kinoshita threw TDs in the period. 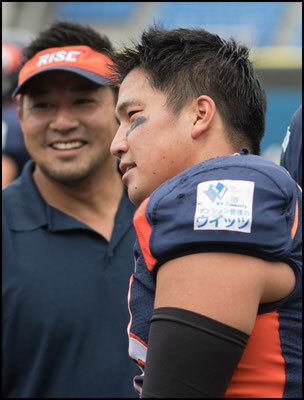 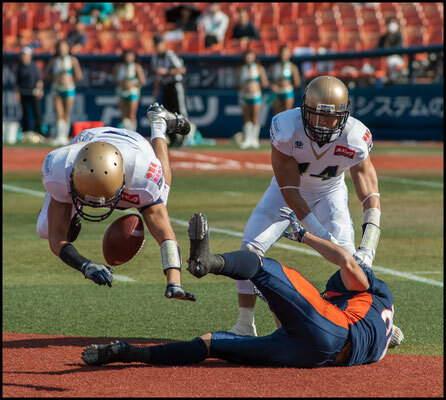 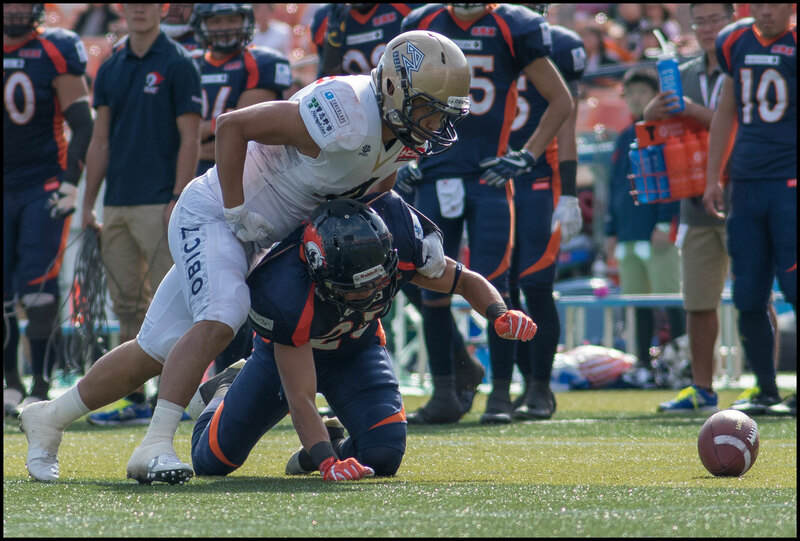 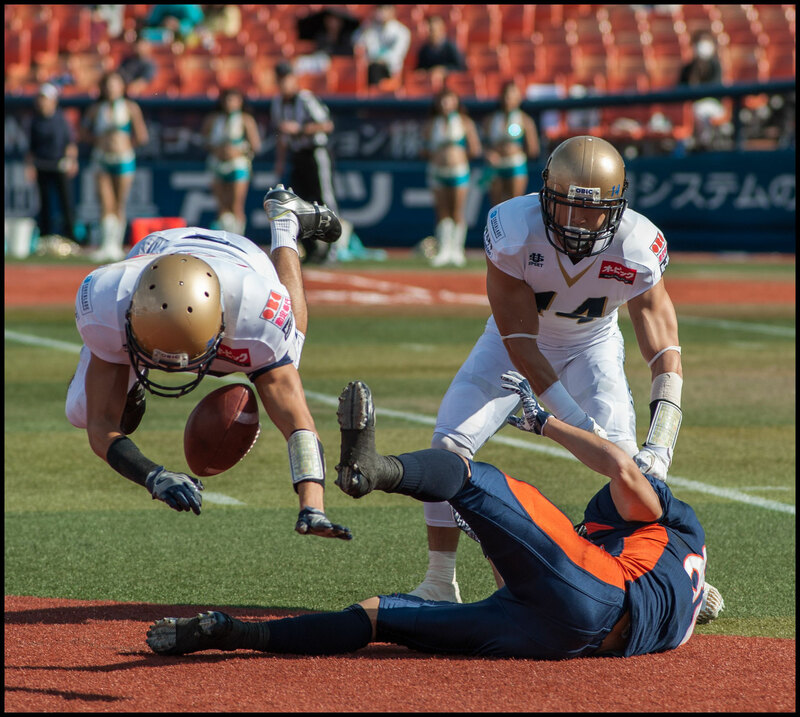 Kinoshita took a pass out near the left sideline, gave one man the slip then hit Ryoma Hagiwara in the back of the endzone. 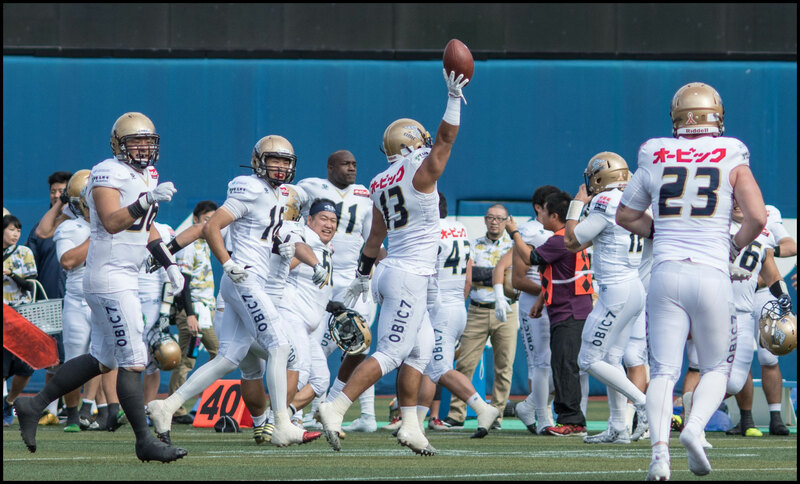 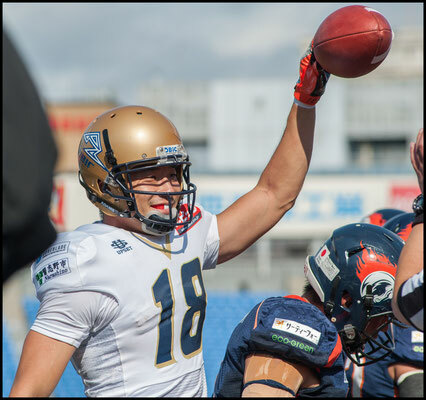 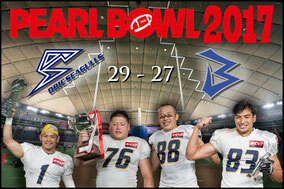 That score came right after Obic recovered a fumble on the kickoff following Sugawara's scoring pass. 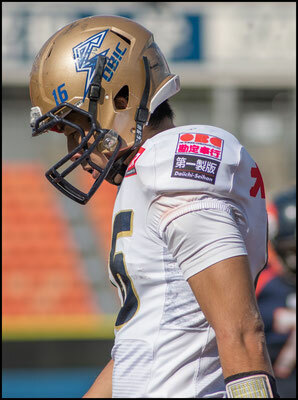 Those 14 points were the dagger that finished off any hopes Nojima might have had of a comeback. After the game BJ Beatty described the Obic defense as Gardner’s Kryptonite and said that the picks came as a result of knowing where the Rise QB had success against them in the past - namely slants and short in patterns - and playing aggressively jumping the routes. 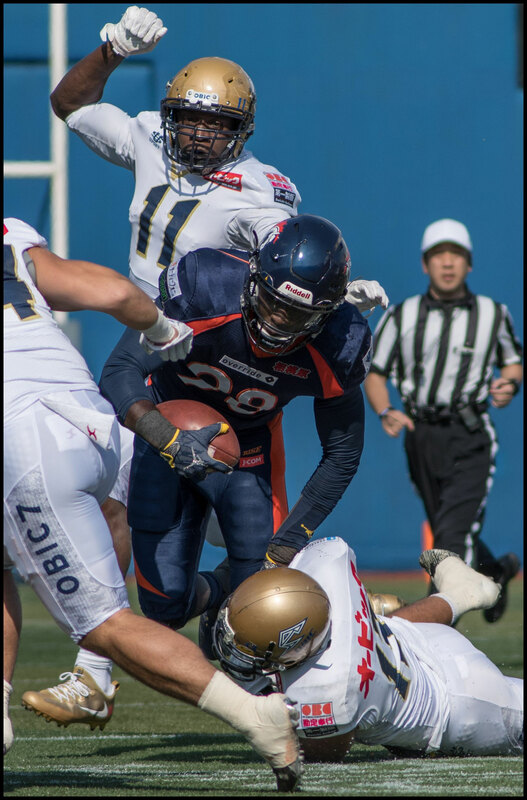 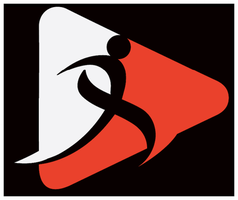 Obic now move on and meet Fujitsu Frontiers in the semifinal at Kawasaki on November 26th in a rematch of last years final. 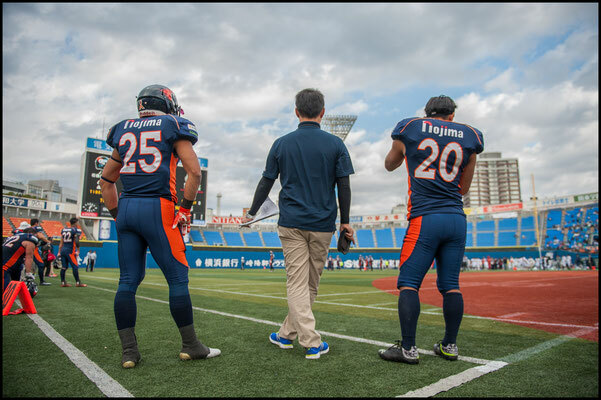 The winner of that will face either Panasonic Impulse or IBM Big Blue at Tokyo Dome on December 18th in the Japan X Bowl.